A ‘Most Arrogant’ Evening with Stone’s Greg Koch (Part 1) | Drink. Blog. Repeat. On Thursday, June 13, Barley’s bar and restaurant in Greenville was officially awarded the title of Most Arrogant Bar in the U.S., a title bestowed annually by the Stone Brewing Co. to the bar that sells the most amount of a certain number of Stone beers. To celebrate the occasion, Barley’s tapped more than 30 rare and unique Stone kegs, and Stone CEO and Co-founder Greg Koch flew in from San Diego to present the plaque and greet fellow craft beer fans. 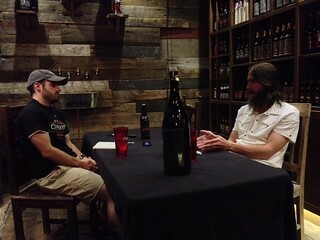 During his visit, Koch sat down with me for an hour-long interview on a variety of subjects related to the craft beer scene. In the first installment of that interview, Koch and I discuss the “Most Arrogant” title, his thoughts out the Southeast and South Carolina beer scene and the potential it shows for the future. Let’s talk about tonight, first off. The Southeast has won this award for the past four years, and now Greenville, SC, wins this award out of all the bars in the country selling your beer. What did you think when you found out Greenville won? (Long pause) Uh … boy, that’s a really great question. (Laughter) My first reaction was, “Sheridan? Really?” (Note: “Sheridan” is Scott Sheridan, who has represented Stone in the Southeast for the past decade.) But honestly, it was, for one, Wow, again the Carolinas – North Carolina was the previous three years and now South Carolina – but this shows a cohesive approach to winning the title. You don’t win Most Arrogant Bar without intending to win Most Arrogant Bar. It doesn’t happen by accident; it happens by intent. So the fact that Barley’s intended to win this is cool, and the fact it was won by the fourth bar in a row that is from the Carolinas that intended to win this is … I think it just says something about the winning nature of people from this region of the United States. You know, if we’re going to bother to do something, we’re going show up. And if we’re going to bother to show up, we’re gonna show up big. And if we’re gonna bother to show up big, we’re gonna take it home and win. How about South Carolina beer. Have you had any experience with SC beer? Have you tried any breweries from around here? Oh, hell yeah. I was at Brewvival a couple of years ago. I gave the keynote that all of 12 people sat and listened to. But whenever I do an event when I travel, I rarely drink Stone. It’s not because I don’t love it and love what we do, but of course I want to enjoy … the reason I got into craft beer was because I am an enthusiast, a geek, and so what would an enthusiast and a geek do? Just try a bunch of stuff because that’s what you like doing. Now, I’m not terribly good at taking notes, and when I’m at beer festivals I’m not terribly good at remembering all the details (laughs). But I can tell you … what’s the name of the brewery right next to Brewvival? Is that a kind of normal thing, that wherever you go you try the local stuff? Oh, hell yeah. I’m not a homer. I’m not a homer in San Diego, I’m not a homer on the West Coast and I’m not a homer here. I have a Stone beer in my hand right now because it’s the unfortunate reality that we sort of bumped everything off the shelf. But anybody that’s visited the Stone Brewing World Bistro & Gardens in Escondido or the one at Liberty Station knows that we have more guest beers on tap than we have of our own beers. It’s a philosophical thing, it’s an enthusiast thing. I don’t think there’s any question that we have full confidence in our beers, but just because we think we make pretty damn good beer doesn’t mean we don’t think a lot of other people also make pretty damn good beer. In fact we know they do, and we love celebrating that as a whole. It’s the culture. In South Carolina, we have three new big breweries coming online this year: Conquest in Columbia, Quest is opening in July and Brewery 85 is opening in the fall. You being in the business for as long as you have, what advice would you give them for longevity. Do what you love. Do. What. You. Love. (He pounds the table to punctuate each word.) Don’t go to the people. This is not arrogance speaking. This is not any of that boisterousness speaking. This is just plain, simple enthusiasm speaking. If they do what they believe in the most, what they love, then it gives me as an enthusiast the opportunity to discover their world. If they try to come to me, if they try to do stuff to make me – the consumer – happy, then they might be discounting their own passion, their own direction, their own talent to do so. I think we’re artisans in this business, and brewing is art and science. You have to pay attention to the science part because that helps you be consistent and it helps you brew what you actually intend to brew. But the art part is as much or even sometimes more critical. And so a lot of folks will discount their own art in favor of what they think people are asking for. So, my piece of advice is, don’t do what people think that they’re asking for. Do what you believe in. Brew your favorite recipe! So many times, someone behind a brewery, a brewmaster will say, “Well, this isn’t really a beer. I brew this because it’s popular. I brew this because it’s what people want.” And, for me, if you brew what the people want instead of what you’re really passionate about personally, then you’re not giving me as a consumer enough credit to appreciate it. I want you to give me credit or be willing to take the risk of just putting it out there. Take the risk, because that’s how you differentiate. That’s how you become something special. Stay tuned for the next installment of our interview. Great advice from a great brewmaster. Pingback: Barley’s looks to reclaim ‘Most Arrogant Bar’ title | Drink. Blog. Repeat.